Novox Caplets (Carprofen) is the generic for Rimadyl and a prescription COX-2, non-steroidal anti-inflammatory (NSAID). Novox relieves arthritis, joint and post-operative pain, and fever. 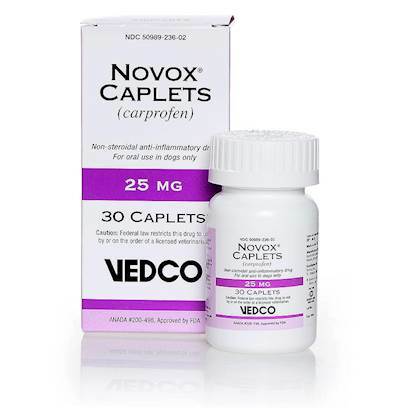 Novox Caplets (Carprofen) are for dogs and pups 6 weeks and older. Signs of Novox Caplets (Carprofen) intolerance may include appetite loss, vomiting, and diarrhea, possibly indicating side effects involving the digestive tract, liver, or kidneys. Some side effects of Novox may occur without warning, and in rare cases, result in hospitalization or death. If symptoms occur, discontinue Novox Caplets (Carprofen) and consult your veterinarian. Consult your veterinarian before adding other medications, including vitamins and supplements, other NSAIDs (e.g., aspirin, etodolac (EtoGesic), deracoxib (Deramaxx), firocoxib (Previcox), tepoxalin (Zubrin), and meloxicam (Metacam); steroids (e.g., prednisone, dexamethasone, Medrol, triamcinolone), methotrexate, furosemide (Lasix) , digoxin, phenobarbital, oral anticoagulants (heparin, warfarin), enalapril, phenylpropanolamine, sulfa drugs, and some oral antidiabetic drugs, since interactions may occur. Administer Novox Caplets (Carprofen) once or twice daily, depending on prescription, based on weight of dog. If you miss a dose, continue on regular schedule. Do not double next dose.